Waverly, Ala. isn’t just a small town. It’s tiny. All 184 of its citizens pushed back when the Alabama Department of Transportation decided to widen Highway 280—which runs straight through Waverly—because it would destroy the 2.7 square-mile town. In 2000, when Alabama ultimately decided to re-route the highway to the south, the town came together to sing and dance in the streets in celebration. They call it the Waverly Boogie. And fourteen years later the celebration continues: On the grounds of Standard Deluxe, guitar legend Junior Brown, Lydia Loveless, Rayland Baxter, Pine Hill Haints, Have Gun Will Travel, The Shivering Timbers and Belle Adair joined to shout proclamations and reminders of what it means to have a place—any place—to call home. 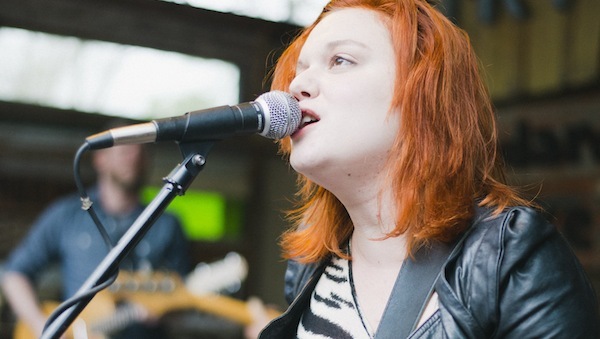 Lydia Loveless came on and lit up the outdoor stage with her rapid-fire wit (and newly dyed red hair) with “Really Wanna See You,” “Wine Lips,” and “To Love Somebody” from Somewhere Else. She’s channeling Jenny Lewis’s attitude and Lucinda Williams’ country folk grit, and it’s definitely working for her right now. She kicked the band off stage (including her husband, bass player Ben Lamb) for the slower half of the set— “Verlaine Shot Rimbaud,” “Somewhere Else,” and “Everything’s Gone”—where she joked it as being the only time she’s ever really alone. Belle Adair’s collective influences of pop, folk, indie-rock and Americana mixed with jangly keys, upbeat drums, humming synthesizers, electric guitar and southern soul-filled vocals were the perfect christening to the festival. The Muscle Shoals-based band play from their first LP, The Brave and The Blue, which continues to gain praise from all over. They also played some new tracks from an album they’re in the process of recording with Civil Wars’ John Paul White. Many Boogie veterans have claimed the Pine Hill Haints as a festival favorite since 2001: this bluegrass/honky-tonk/folk band describes their music genre as “Alabama Ghost Music.” Frontman Jamie Barrier uses supernatural southern tales as inspiration for his tunes, which he sings into a supposedly haunted old-school microphone. He’s backed by his wife, Katie, who plays mandolin, washboard and saw, Matt Bakula on washtub bass and tenor banjo and Ben Rhyne on snare drum. Other highlights of the festival included stylings from the Florida-based Have Gun Will Travel, an alternative folk-rock band with a funky punk influence, and the Shivering Timbers, an Ohio-based husband-and-wife folk duo whose daughter Susie plays tambourine and hand bells. As the years go on the lineup gets better, and this authentic, intimate setting isn’t something you’ll want to miss out on. Check out Standard Deluxe’s Facebook page in the next few months for information on the 2014 Fall Boogie, which will be on September 13. You can check out the full gallery of photos for the event here.